Don't get too excited. I'm not making any predictions with the title. I really don't talk much about being pregnant. But since this is the last time I'm going to do this, I figure I should. But I warn you it's probably not going to be pleasant. I'm 39.5 weeks pregnant. I'm as large as a whale. And I feel like I constantly have a midget kicking me in my who-ha. Oh yeah, and any time I stand up I get the overwhelming urge to pee and then as I waddle rush to the potty only 2 drops come out. Thanks for that fetus. I have a love/hate relationship with natural child birth. I'll talk more about that in another post if I don't pop in the next hour. Cause I really want to make this quick and go get some ice cream before the kids wake up from nap time. Yeah, 39.5 weeks pregnant and feeling like there is a midget slamming a bowling ball over and over again into my pubic bone, that calls for some midday ice cream. Don't judge. Anyway, I've never really had this feeling of Labor Eve. When I went in for Sarah's 40 week check up, I had made no progression past 2 cm, nothing was effacing, the doctor said it wasn't happening and went ahead and scheduled me for an induction to be for the following week. Ha ha. All Sarah was doing was being polite and punctual because dead on her due date she made her entrance without any drugs. At Cody's last check up before he was born again I'd been hanging out at 2 cm, no big deal. I am notoriously uncooperative for the weekly pelivic exams and the doctor even questioned me about my birth plan of not using an epidural. Ha ha. Bam! Unexpected car birth! I got this. I had my 39 week check up Friday. I'm at my normal 2 cm, whatevs. But my doctor was surprised to see that in a week I'd effaced up to 60%. I don't remember ever being told effacement numbers with the others. She asked if I had felt any contractions in the previous week and I said, just a few Braxton Hicks. To which she said, well, apparently some of those were real cause you're a moving right along. She confidently said she won't see me at my 40 week check up this coming Friday but will stop by if she's on rotation at the hospital when I'm there. She also teased that she thought I wouldn't make it through the weekend. AHHH! Not make it through the weekend! But I haven't even bought diapers yet. Or washed the baby car seat. OR PICKED OUT NAMES! For our date night Friday, I made Chris take me to target so we could buy Dreft and then went home to wash the car seat to ward off any bad juju. See, one thing I love about natural child birth is now the main thing I hate. I love not knowing. I LOVE not knowing when it's going to happen. It's so fun. It's a little scary. And with having 2 kids there's a little more anxiety of what will we do with them. But honestly since Sarah was in the back seat when Cody was BORN I'm not as worried this time about what to do with them. We're going to pack them up and bring to the hospital while Chris calls someone to come meet us there in the lobby to sit with them. No big deal. There is just something so anxiously exciting about not knowing. I've never sky dived. I'm terrified of heights. But I want to go someday. And I will have to have the person just shove me out because heavens knows I'm not going to jump. And I think that's the best way to describe waiting for labor. You're standing on the edge of the airplane with the door open waiting for Heavenly Father to push you. It's awesome and terrifying at the same time. But you have a baby in the car once and all of a sudden it's a little more scary. It makes you a little gun shy. Cause one car baby is funny, doing it twice I feel would be tragic. Especially cause I don't think I'll make it to the car, I'll probably have it in the kitchen and I really don't want to clean up THAT mess. So with my Dr saying it's coming and it's coming soon. And me apparently not being able to tell the difference between Braxton and real contractions that got me 60% effaced. I'm a little nervous about waiting too long again and having another interesting arrival. And so it's making me first time mom jumpy. (It's making Chris even worse. So help me every time I breath funny he asks if he needs to go get the bags.) Every time something hurts I stop and wonder, is this it? And since your body makes you forget EVERYTHING about the last time you did this I can't even compare it to what it felt like last time. So I just keep telling myself, you'll know when it's real. You know. I don't know how I'll know, but I know that I'll know. It will be undeniably real. At least I hope. But we made it through the weekend, which I decided called for a celebration. 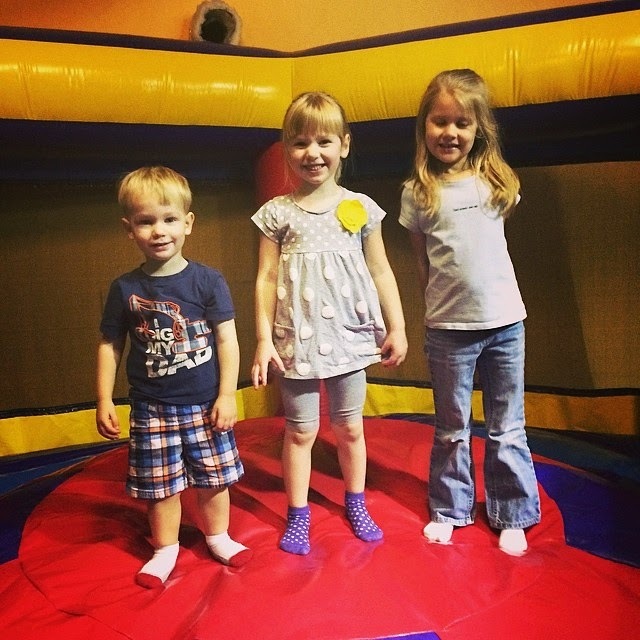 So Annie and I took the kids to Pump it Up for one last fun day before the big day. And for the record, I did not get to jump. Not that I didn't try. But just standing in there trying to get Cody on top of the mountain thing was KILLING me. The evil bowling ball wielding midget in my pubic bone ensured no shenanigans for me this time. Ah sweet children, little do you know you life is about to change. But I guess I'll explain that to them on the drive to the hospital. Good plan. Oh I'm praying you get to the hospital and get settled in a little before this little one comes, lol. Cody probably wants all the "wow" factor for being born in the car. Can't share that with little bro or sis. And you aren't the only one that can't tell Braxton Hicks from real ones. I got slapped in the hospital for a week for preterm labor with Brooklyn. I went for my dr appt at around 30 weeks and she asked if I was hurting. I said "no, why" and she said "you are having contractions right now". Ooh, yea I guess my stomach feels a little tight and tingly but no big deal. Oopsy.